The Amish Lexington Hutch's hand-rubbed standard finish creates a warm, rustic tone for your dining room. 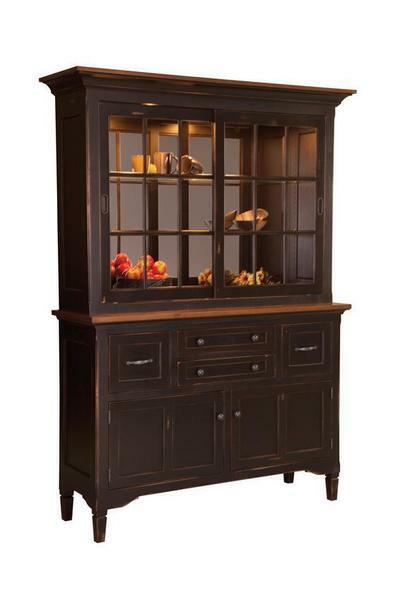 This beautiful solid wood hutch features sliding glass display drawers. This contemporary hutch design feature provides both functional convenience and a traditional mullion ambiance with no hinges or handles. The Lexington Hutch is available in your choice of six hardwood options, a wide variety of hardware, and many high-quality protective finishes. Call DutchCrafters today with any questions or to begin an order at 1-866-272-6773 for this beautiful Amish made hutch.